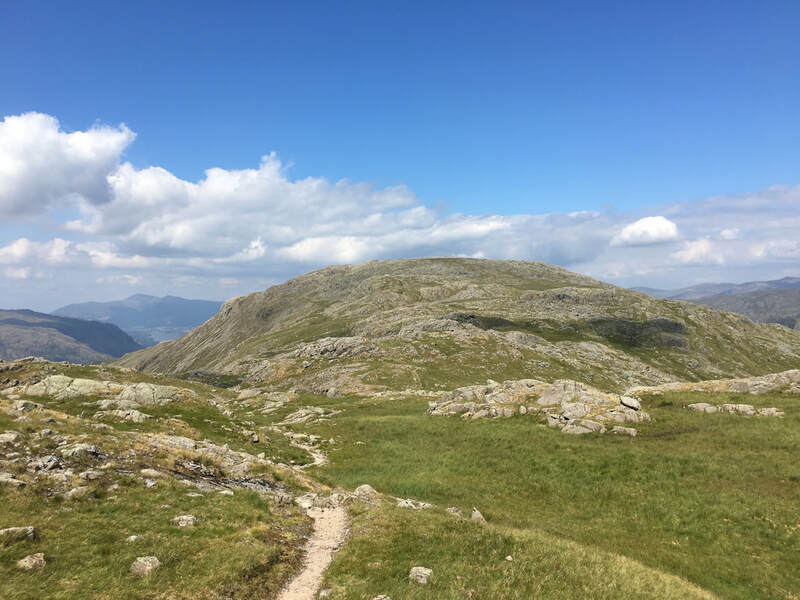 Good mountain paths for the majority of this walk. 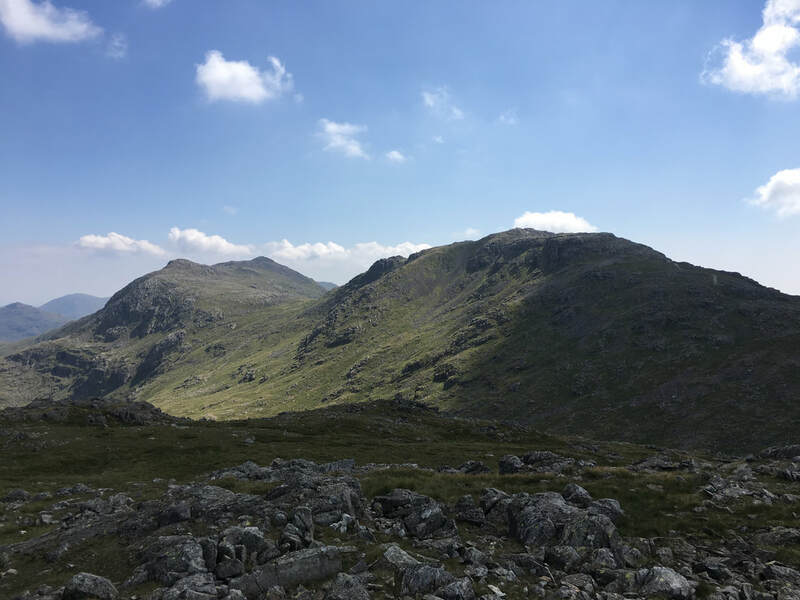 The ascent of Seathwaite Fell is on good yet faint path at first but peters out near the summit. 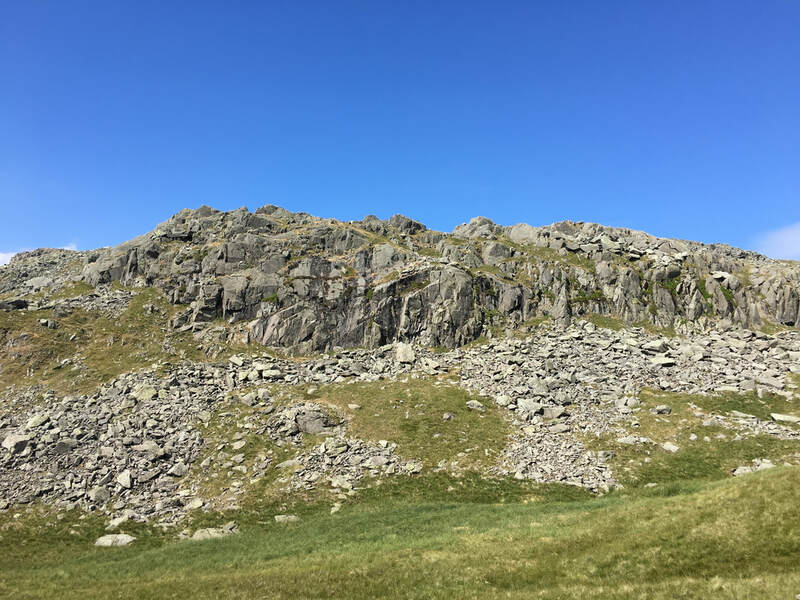 Additionally, the paths on the actual summit of Seathwaite Fell are indistinct. 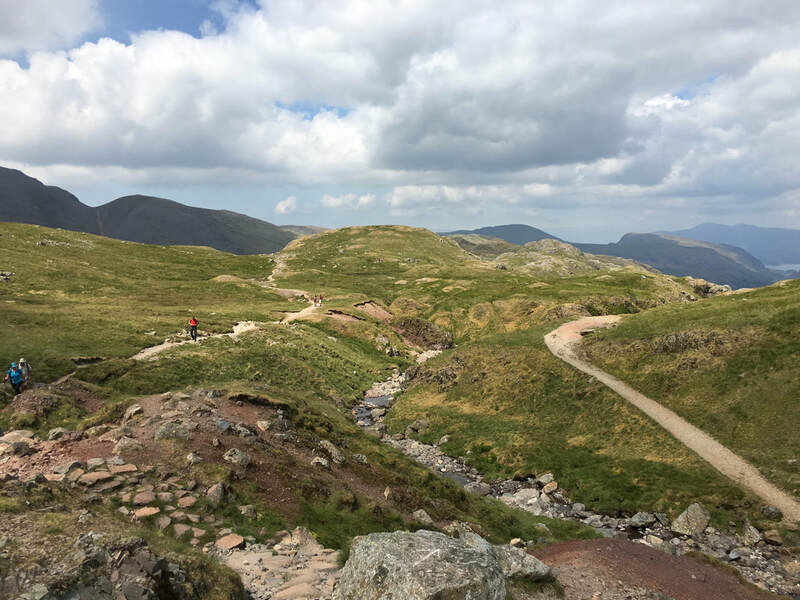 The descent from Rosthwaite Fell (Bessyboot) to Combe Gill is pathless for the most part. 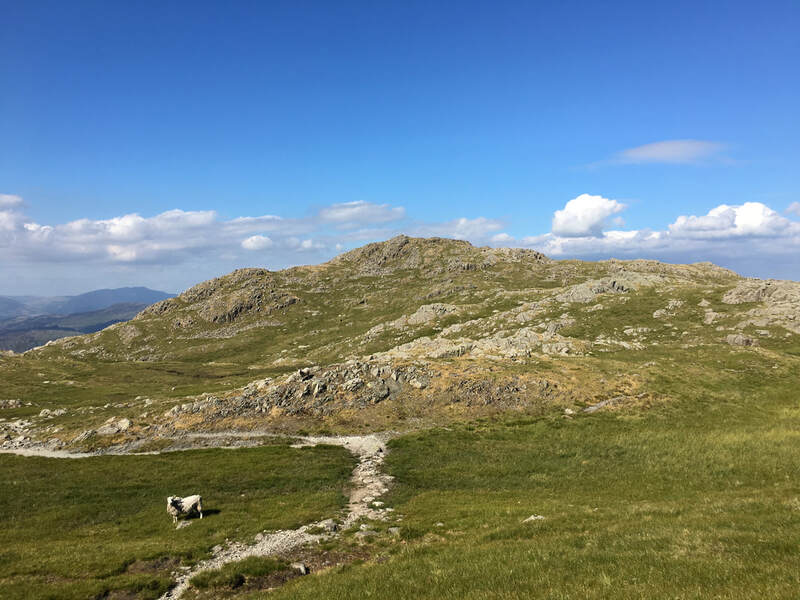 The walk today was a repeat (almost) of one we last completed almost 2 years ago (link here). 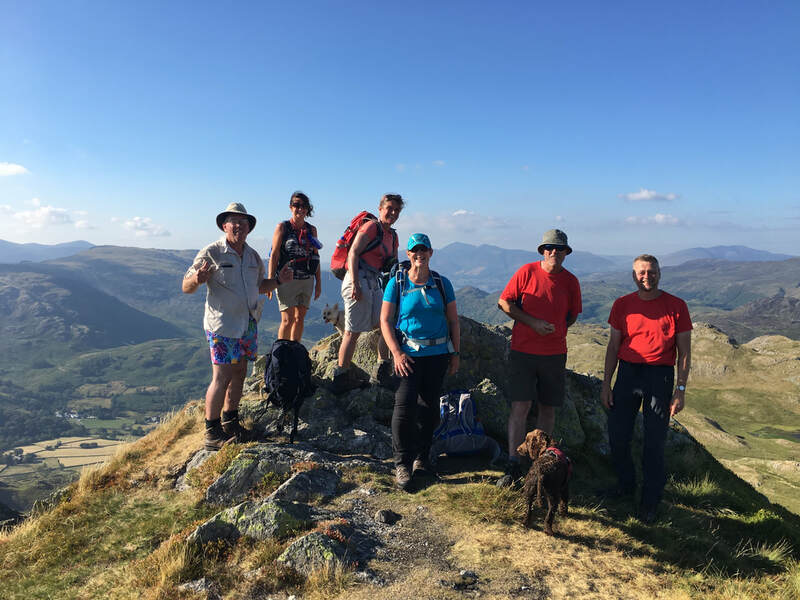 We were out today leading a walk for Lakeland Meet Ups and therefore Angie & I met up with Deborah, Alan, Michael, Martin & Sharon at the National Trust Car Park in Seatoller. 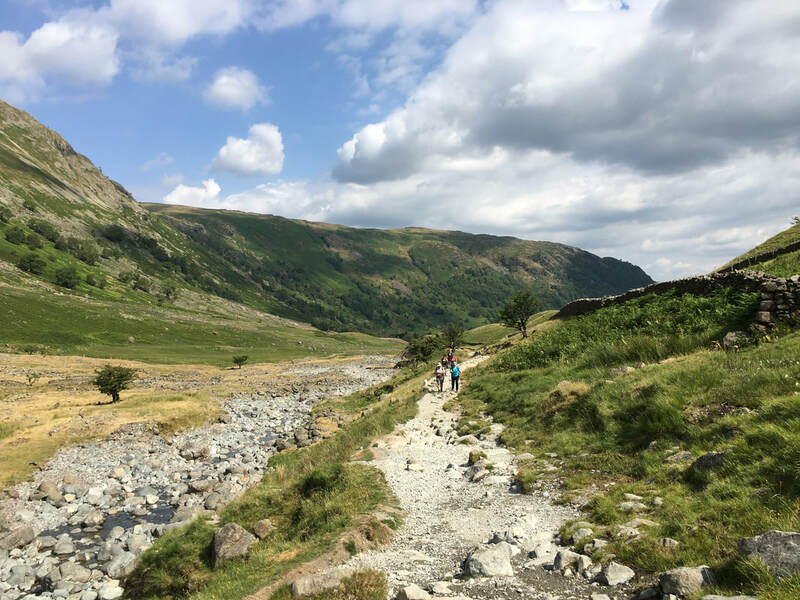 The more obvious start for this walk would be further down the valley near Seathwaite Farm (parking for which is free along the verge) however our route today would bring us back in to Seatoller therefore there was nothing to be gained from starting at Seathwaite. 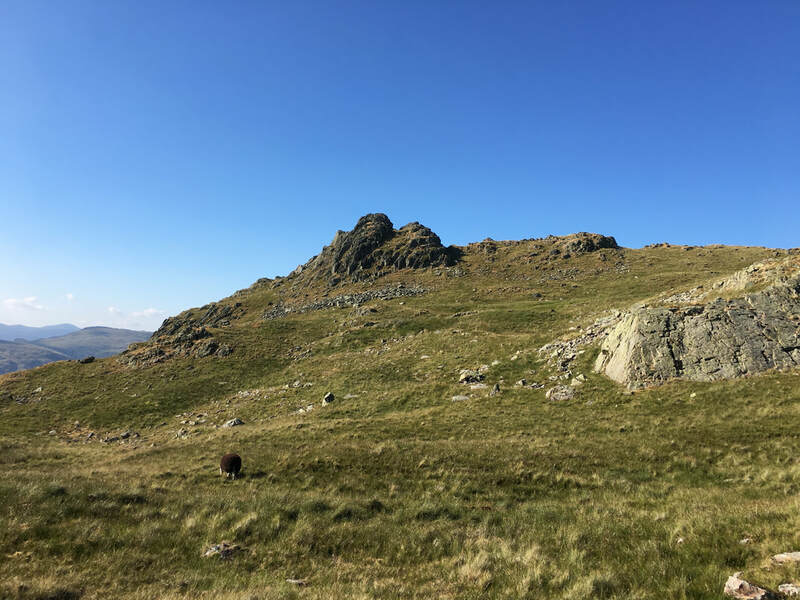 The route to be taken was to proceed on up the valley to Stockley Bridge from where we would then head right on the Sty Head path, leaving this for Seathwaite Fell. 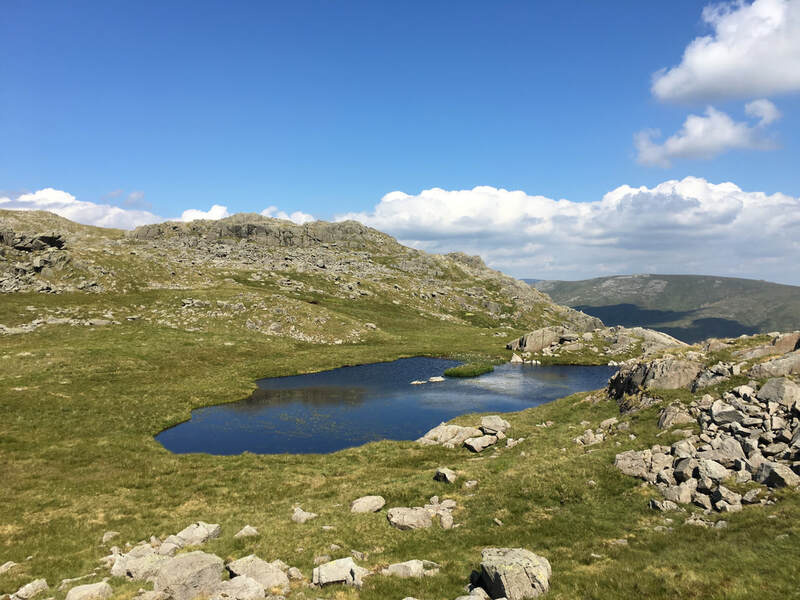 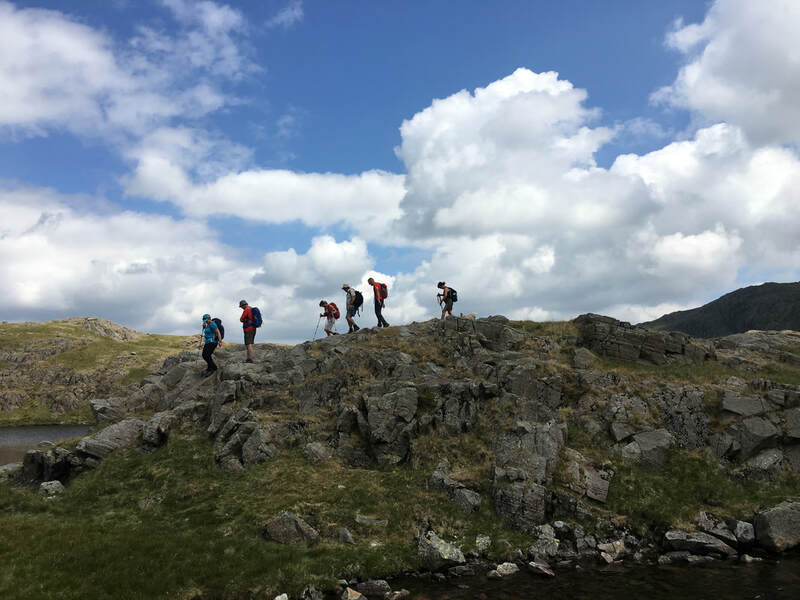 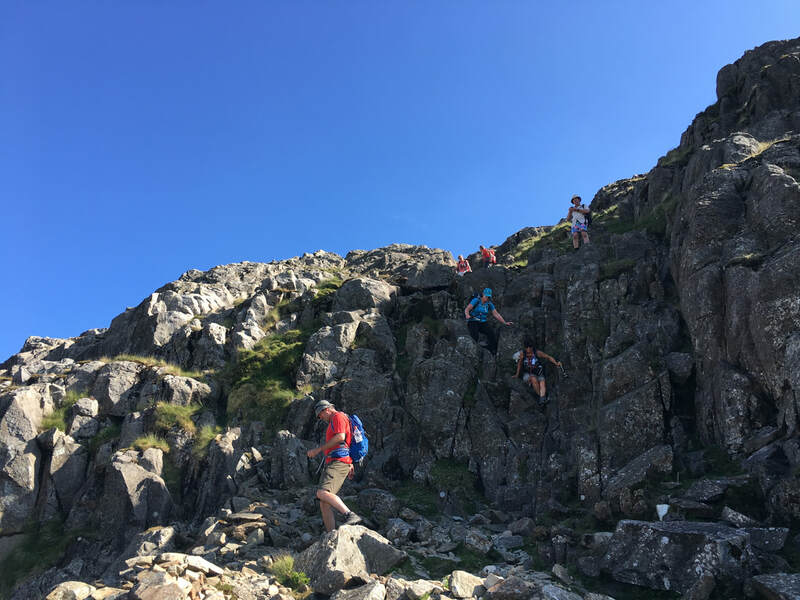 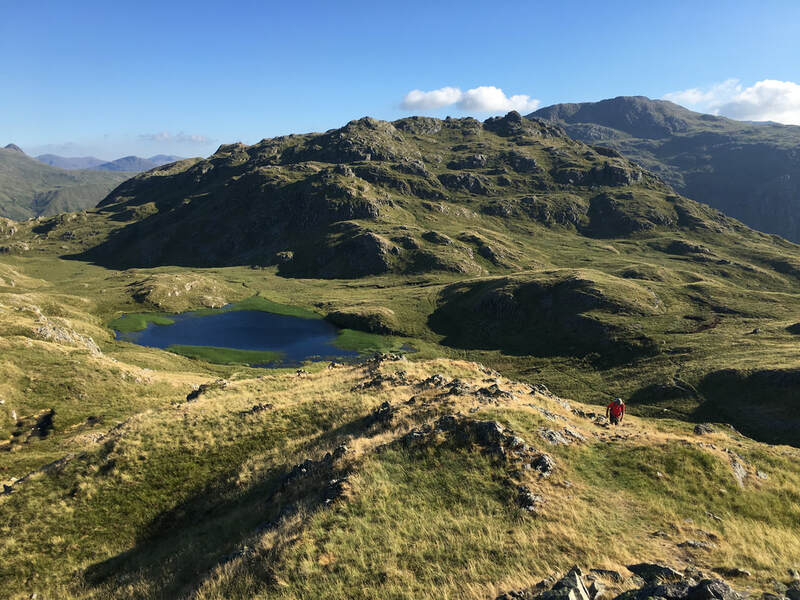 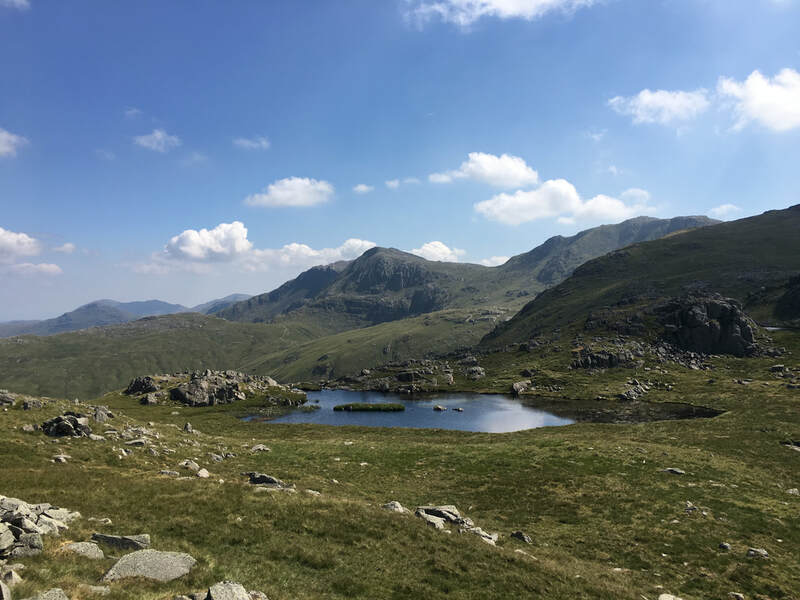 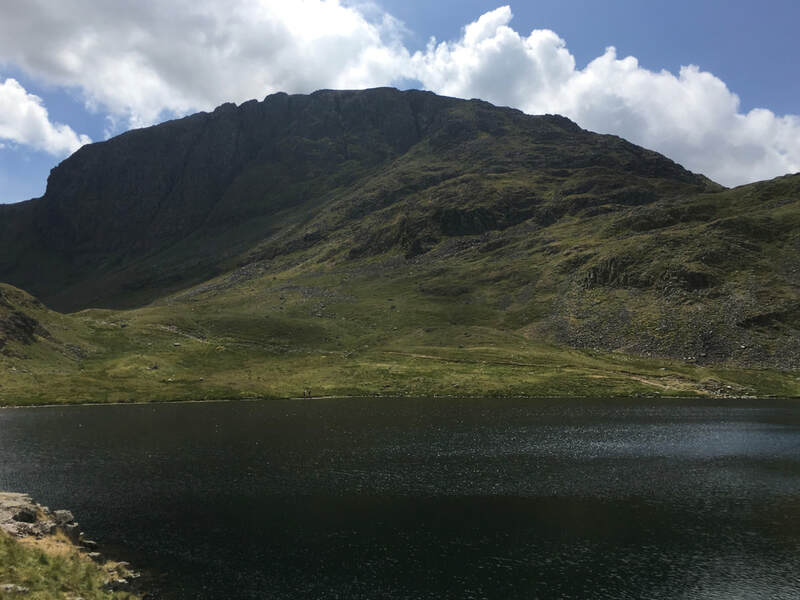 After visiting the 3 summits on Seathwaite Fell, we would then drop down to Sprinkling Tarn and head to below Esk Hause, then to Allen Crags and along the lengthy Glaramara ridge. 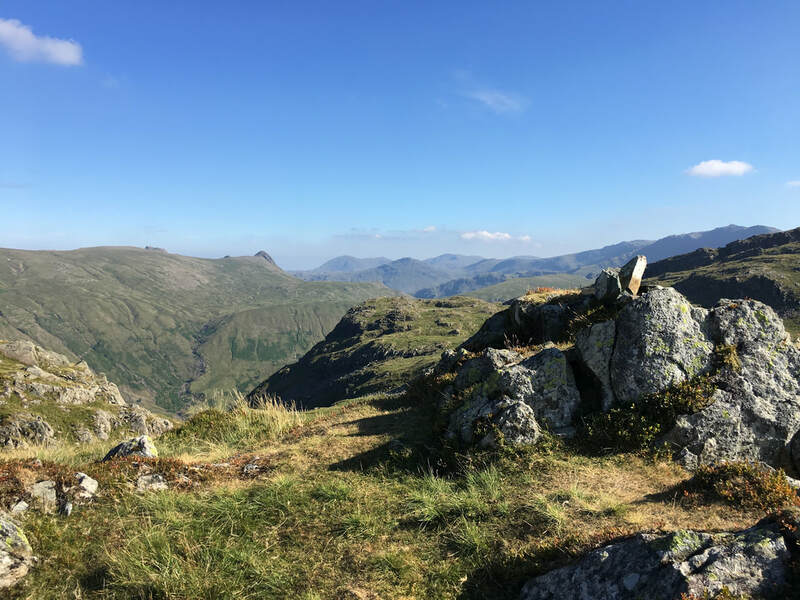 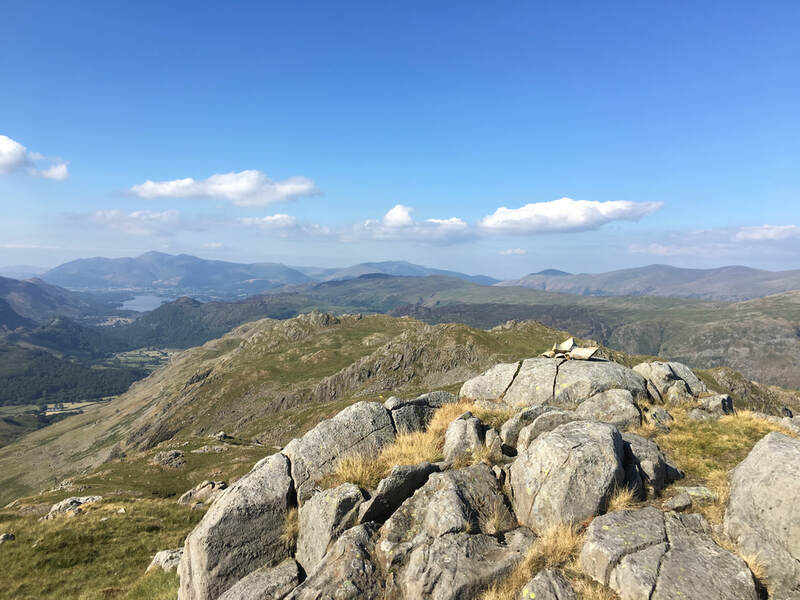 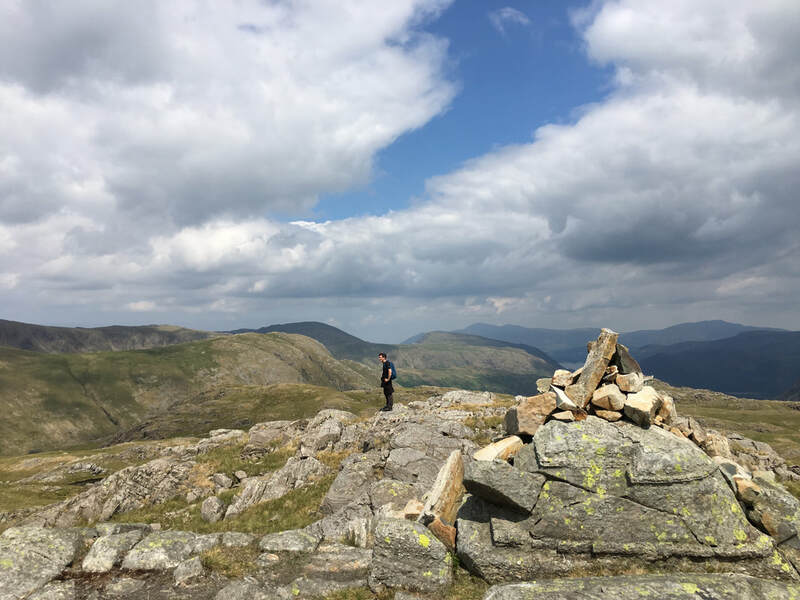 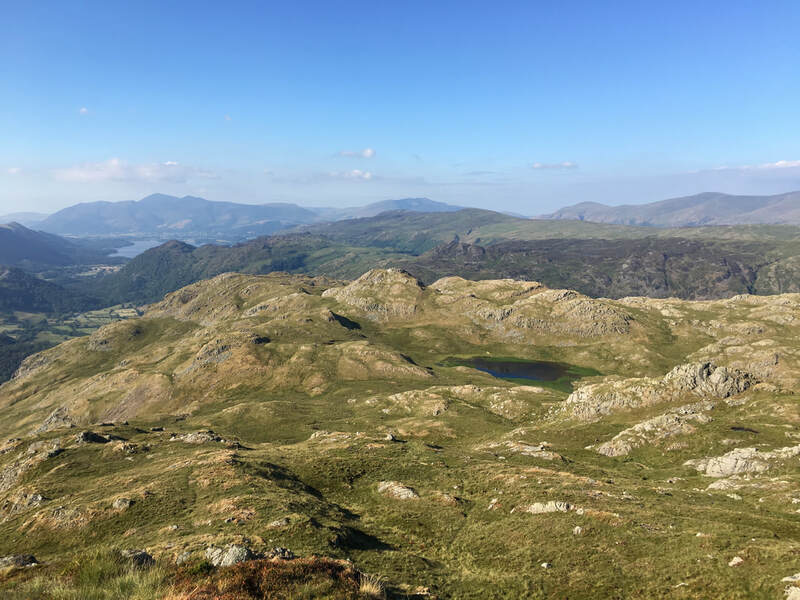 From Glaramara, the plan then was to head back to Borrowdale via the 4 Nuttalls of Combe Head, Combe Door Top, Dovenest Top & Rosthwaite Cam to then finish off on the Wainwright summit of Bessyboot on Rosthwaite Fell. 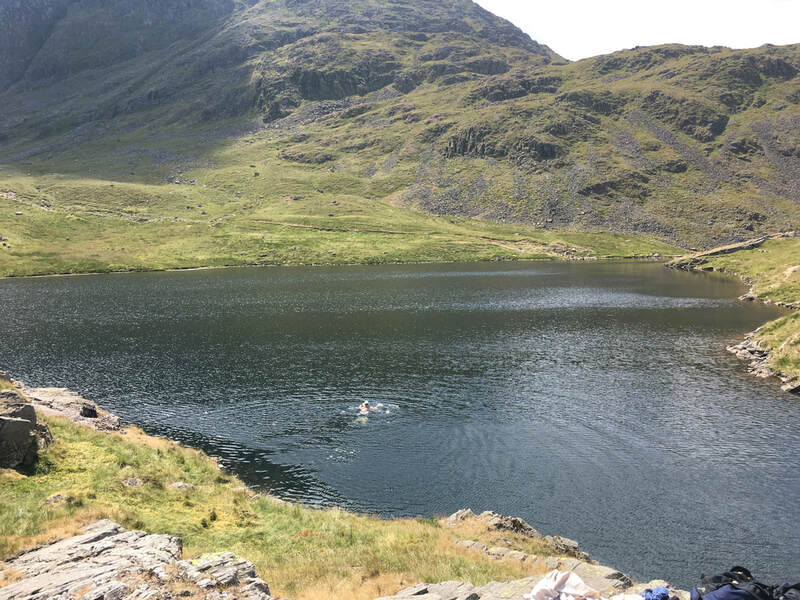 The weather promised a glorious day of wall-to-wall sunshine and high temperatures - it looked a good opportunity for a swim too. 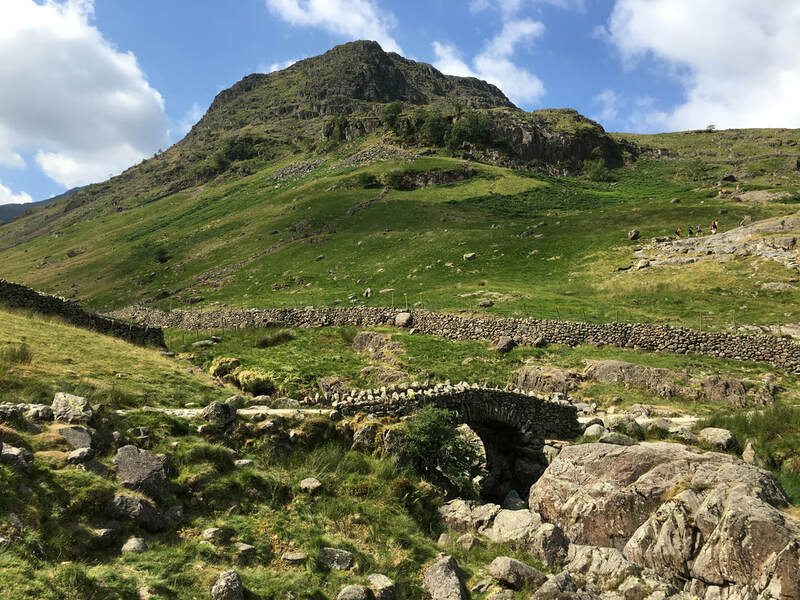 After just under a mile of road walking the route reaches Seathwaite Farm, passing through the farm buildings to emerge on to the path to Stockley Bridge - once over the bridge it is left for the Grains Gill path to Esk Hause or right for Sty Head. 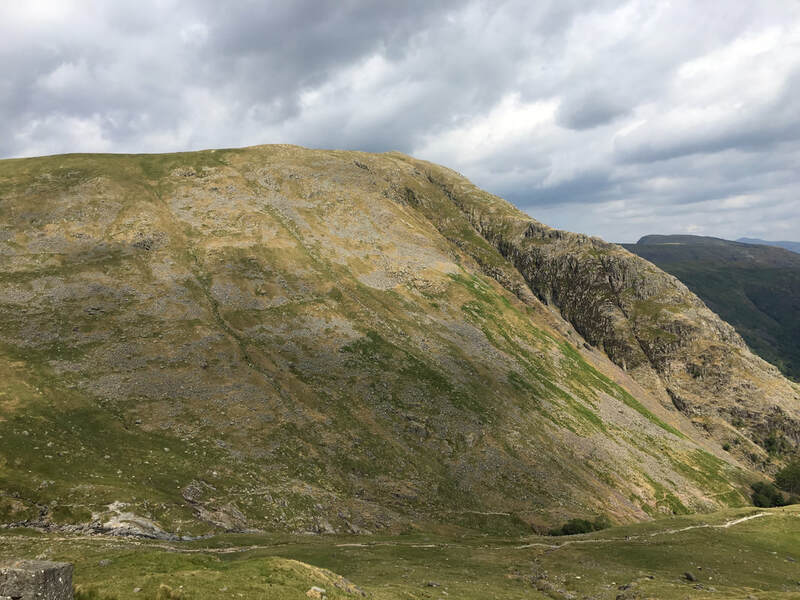 We headed to the right on the steep incline that weaves its way up via Greenhow Knott where thankfully the gradient eases. 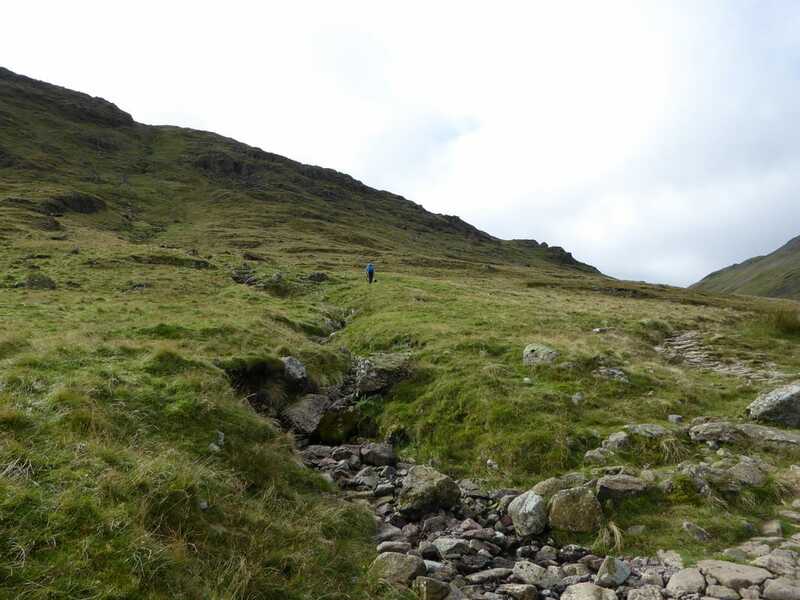 The path to Seathwaite Fell leaves the Sty Head path at GR NY 22765 10659 to head up the right hand side of a bouldery stream - it is easily missed. 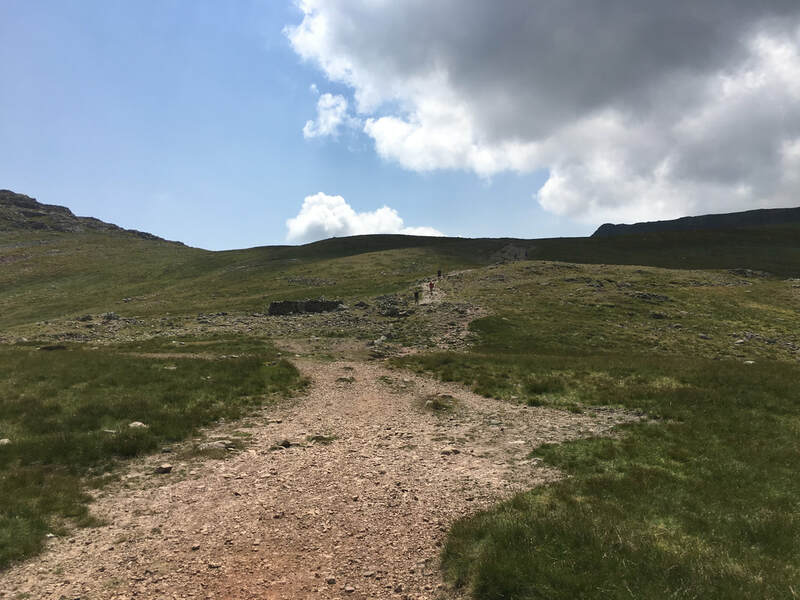 The ascent is steep and the path is faint for the most part, petering out near the summit although there is the odd cairn here and there. 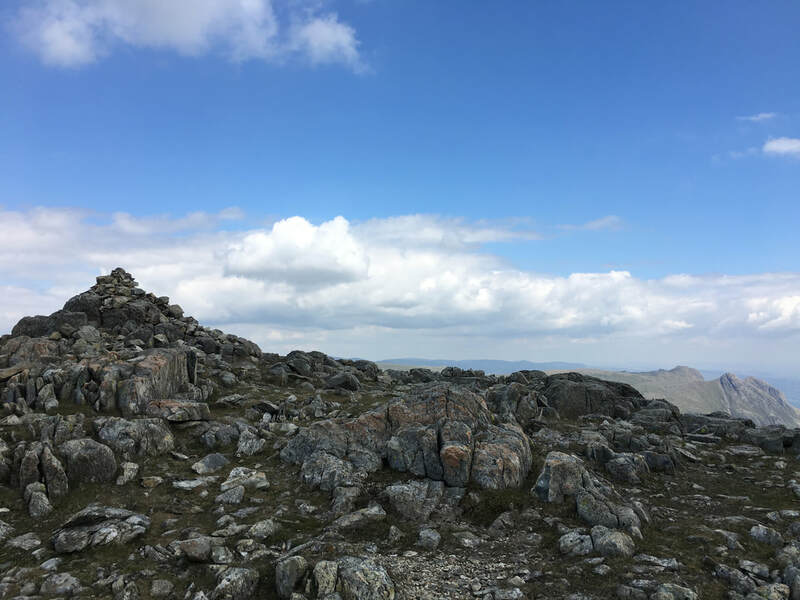 Reaching the crest of the rise, we first visited the Wainwright summit then headed over to the highest point on the fell, Great Slack and then visited the South Top. 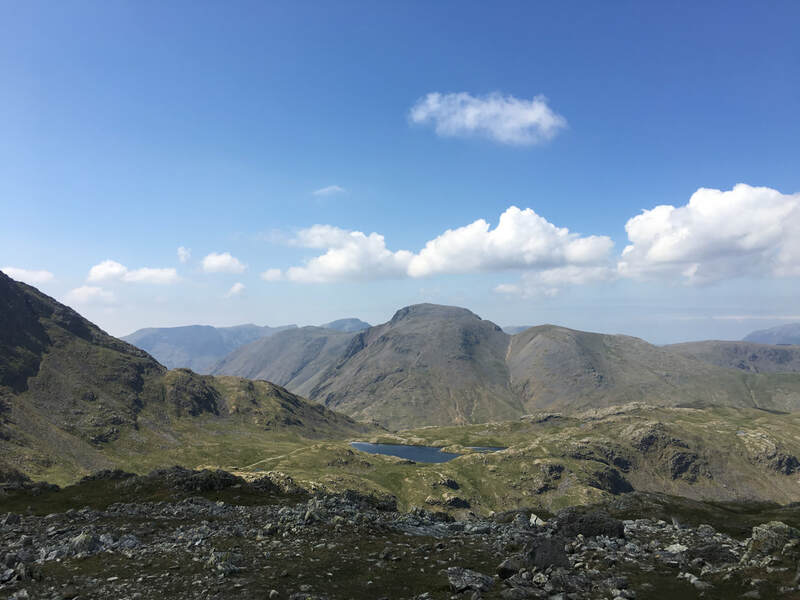 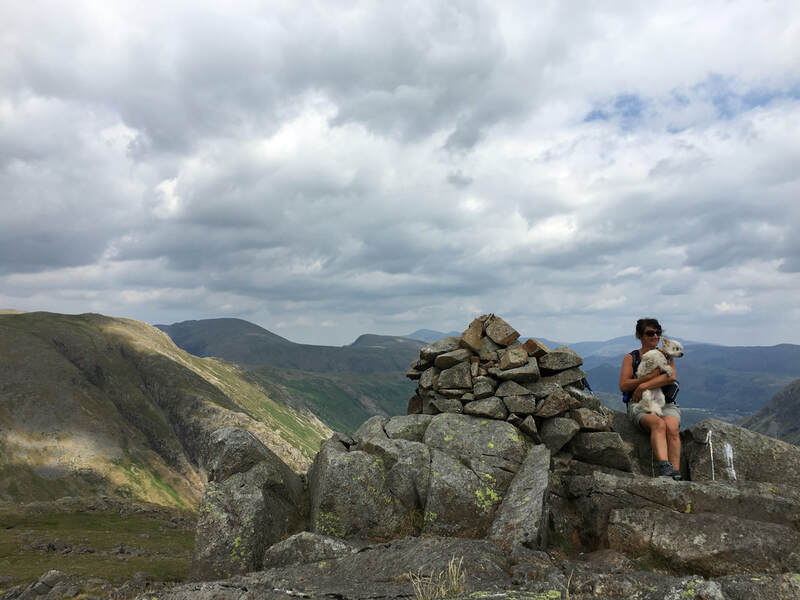 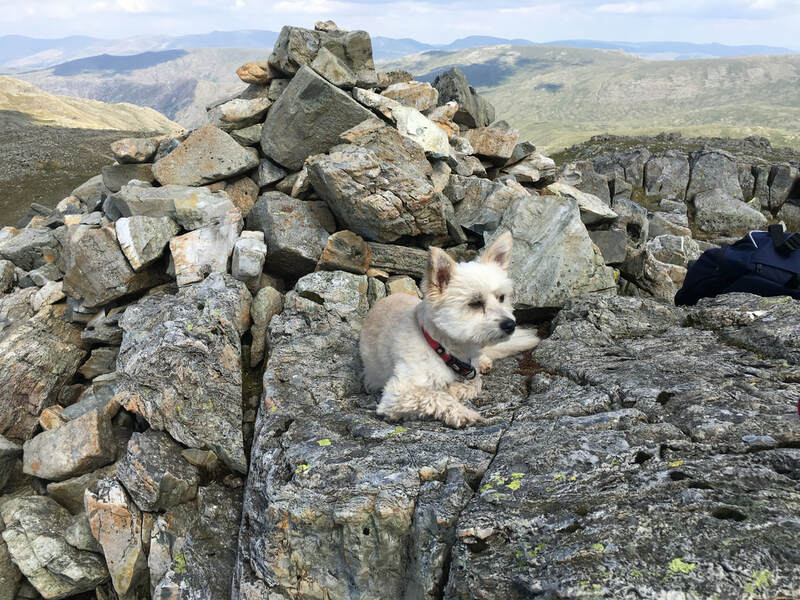 The summit plateau is worth exploring - full of interest and tarns plus the views are exceptional, particularly over to Great Gable, Great End and down into Wasdale. 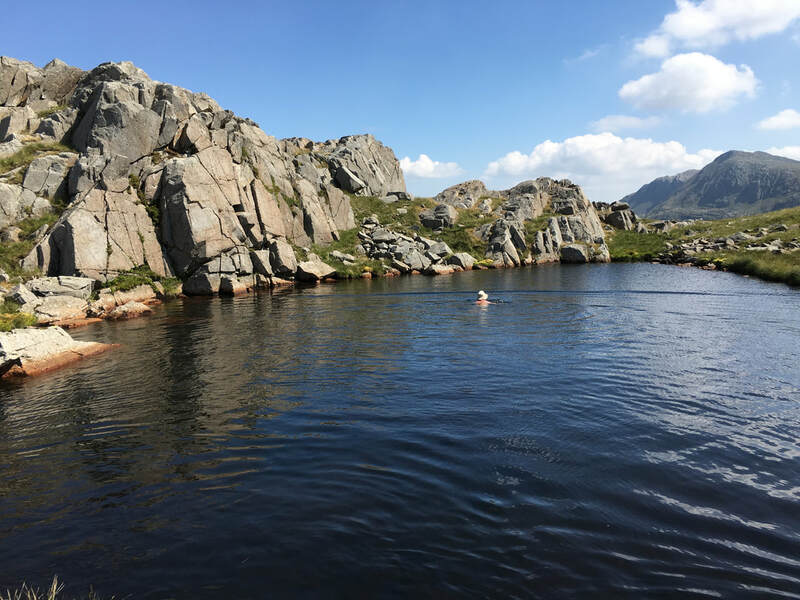 From the South Top the route drops down, firstly to a tarn then over a crest to the idyllic and serene Sprinkling Tarn - we rested here for a while and enjoyed a lovely dip in the tarn before heading uphill towards Esk Hause. 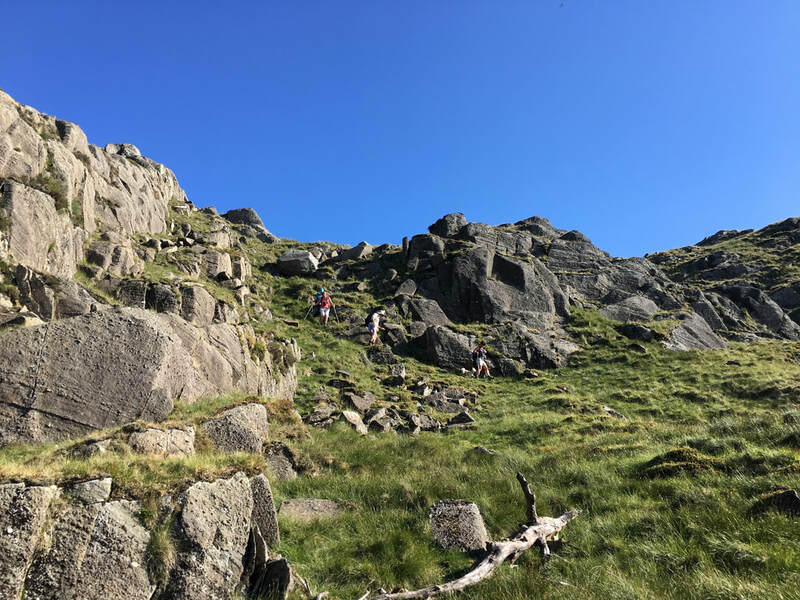 There are several options back to Seatoller from Glaramara's summit - descend via Hind Gill, via Thorneythwaite Fell or go with our original plan of bagging the Nuttalls of Combe Head, Combe Door Top, Dovenest Top & Rosthwaite Cam and then descending via Combe Gill after nipping up Rosthwaite Fell to Bessyboot. 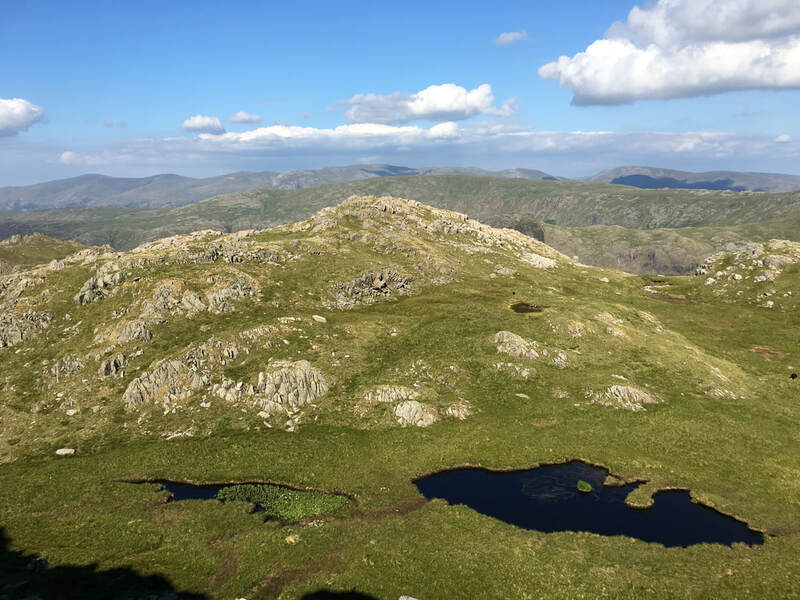 From Glaramara's summit there is a 20ft rock groove to negotiate which could be tricky in the wet although there is an alternative path around the side that comes out below the crags. 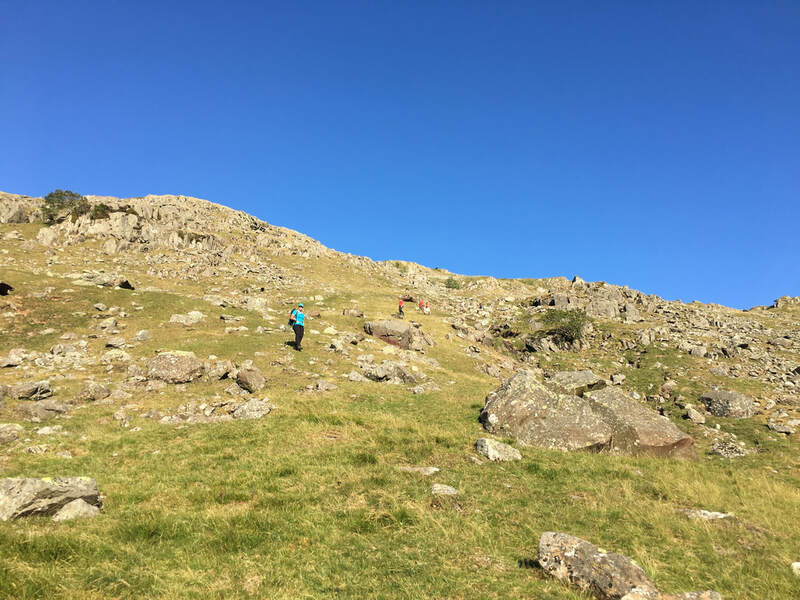 From the rock groove it is about a quarter of a mile to the summit of Combe Head to then a steep drop via Combe Door to the summit of Combe Door Top and then to Dovenest Top a little further on. 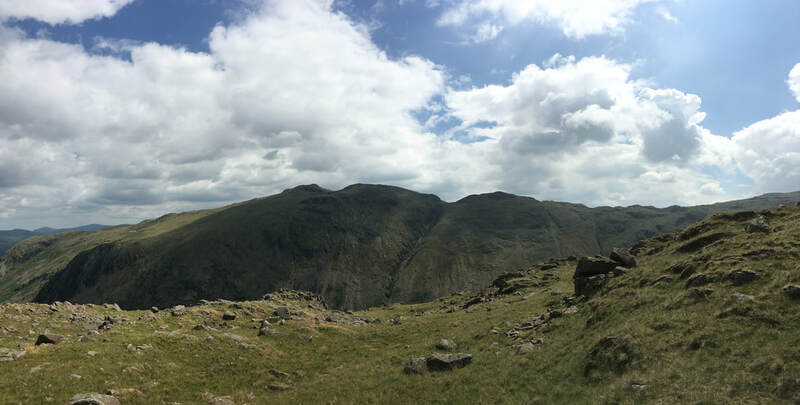 All 3 summits are worth visiting for the views alone - particularly on such a good a day as today. 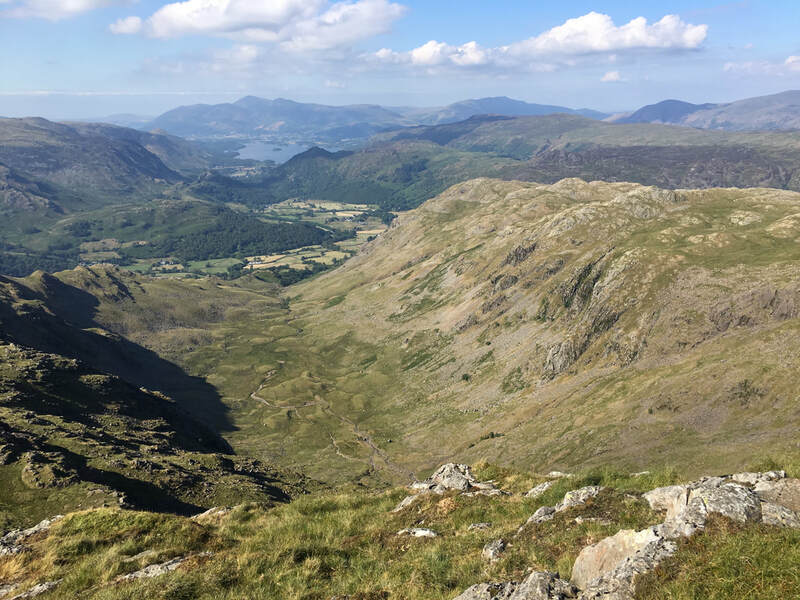 From Dovenest Top the route descended in to Great Hollow before rising out of it to climb steeply to reach the summit of Rosthwaite Cam from where there are superb views down to Tarn at Leaves, Bessyboot and right down Borrowdale to Derwent Water and on to Skiddaw & Blencathra. 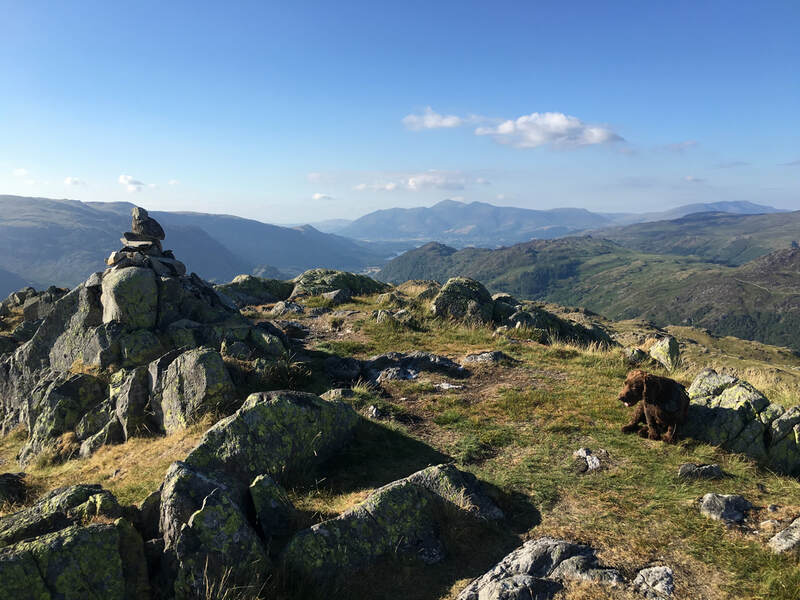 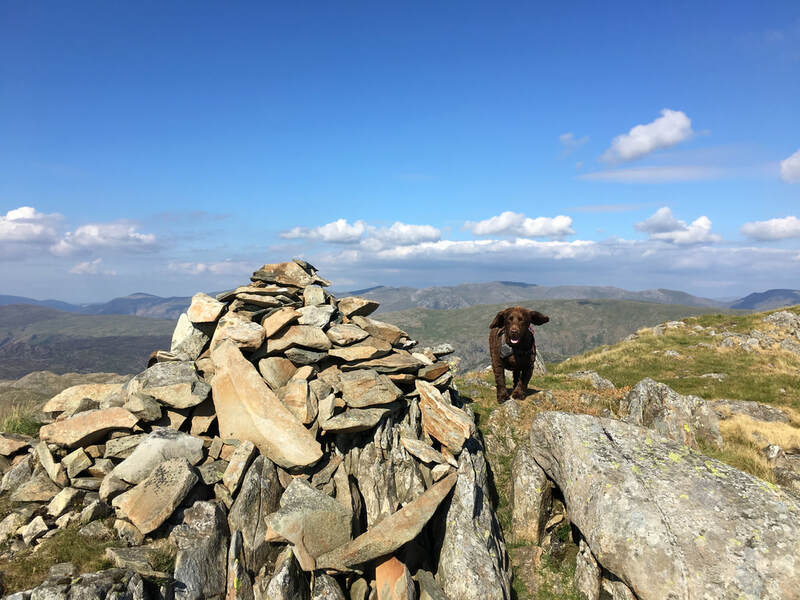 Unlike last time we were here, we made the short journey up on to Bessyboot, the Wainwright summit of Rosthwaite Fell from where we descended, pathless for the most part to the valley floor and Combe Gill. 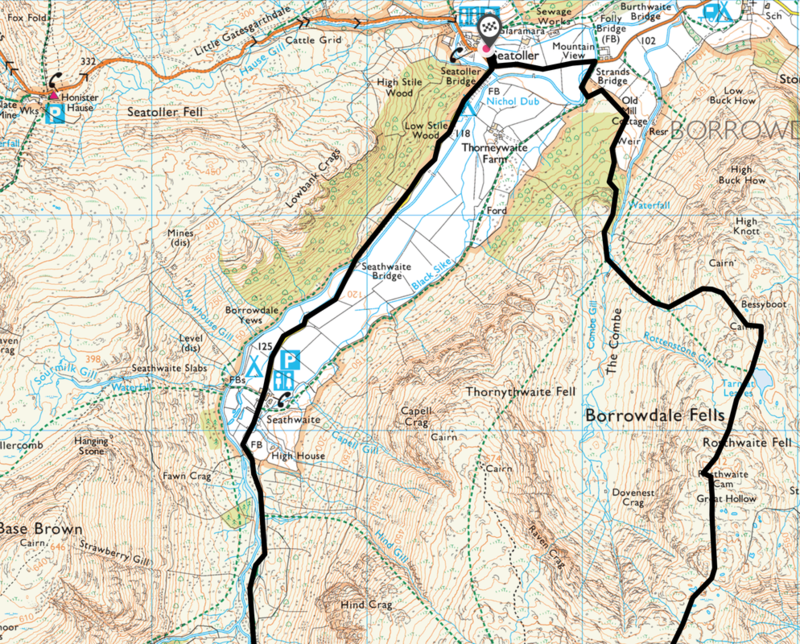 Once down at the gill a good path leads through woodland to eventually reach the road at Mountain View - from here it is a short walk along the road back to Seatoller. 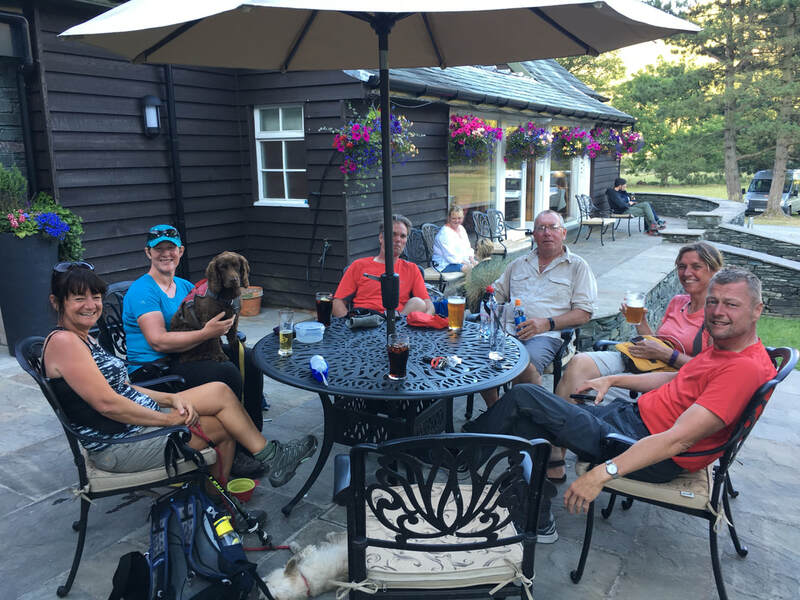 All that was left to do was have a customary debrief, this time in the adjacent Glaramara Hotel. 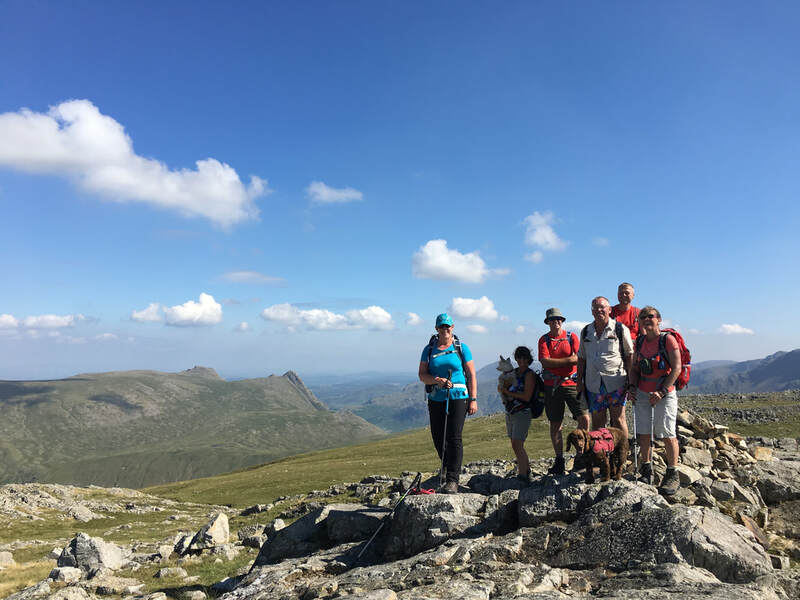 Another fantastic day out and lots of laughs with great company - this was one of our best days out on the fells. 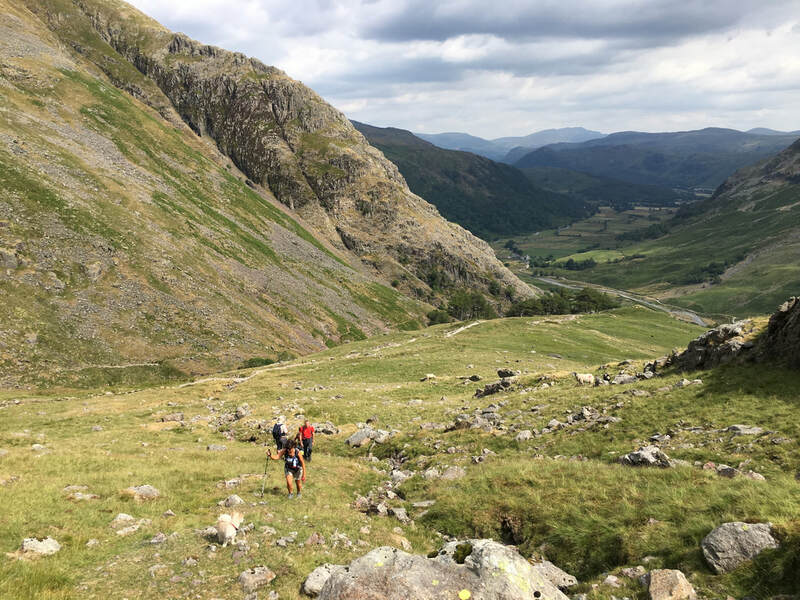 Heading up Seathwaite Fell with the Borrowdale Valley providing the backdrop. 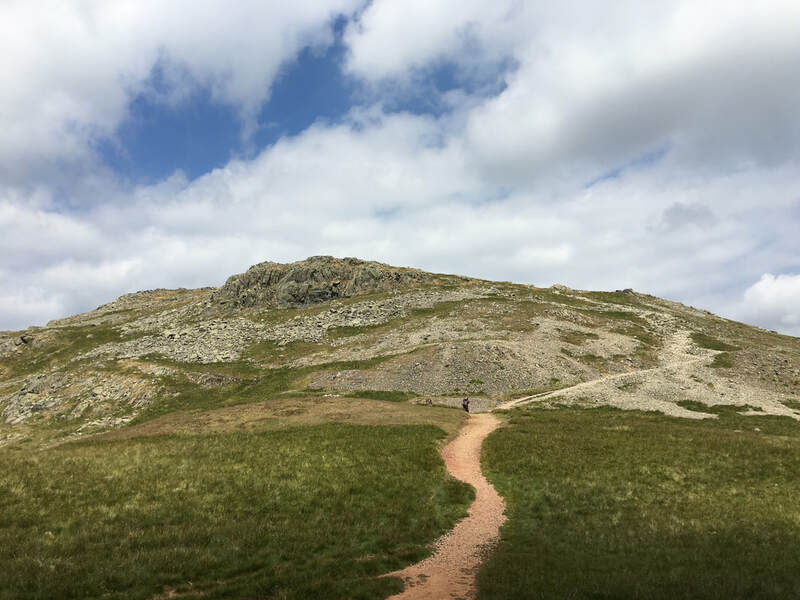 The path from Stockley Bridge to Sty Head can be seen below. 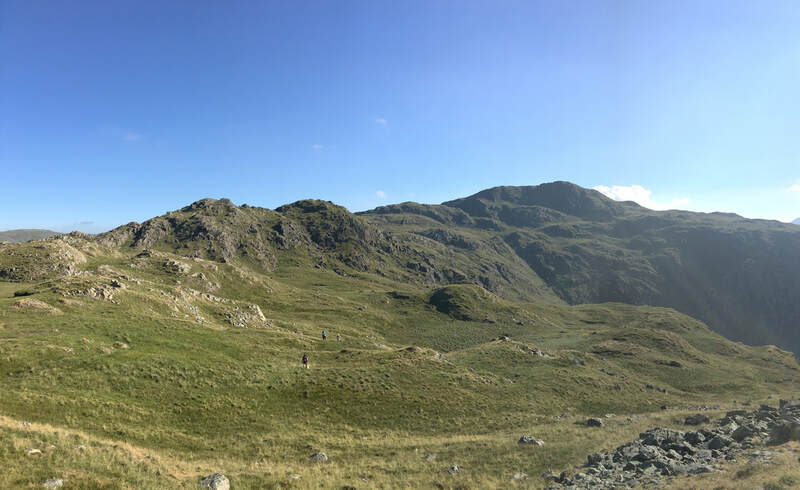 Esk Hause above the shelter with Ill Crag peeping out to the right. 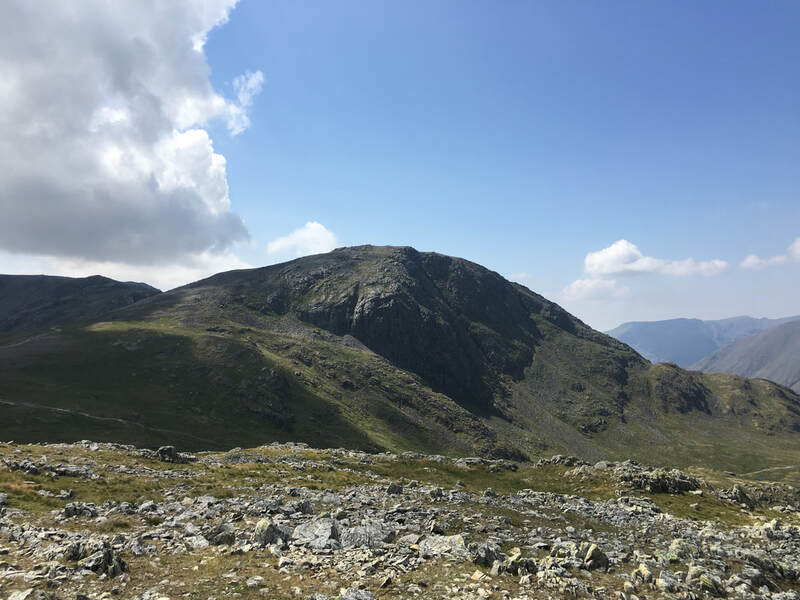 The lower slopes of Esk Pike are to the left. 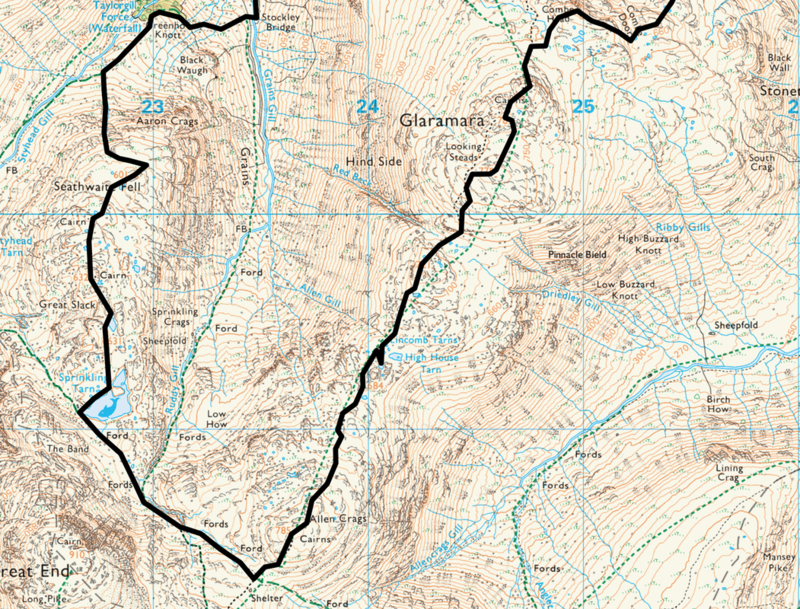 Our route from Sprinkling Tarn over which can be seen, amongst others Great Gable & Green Gable. 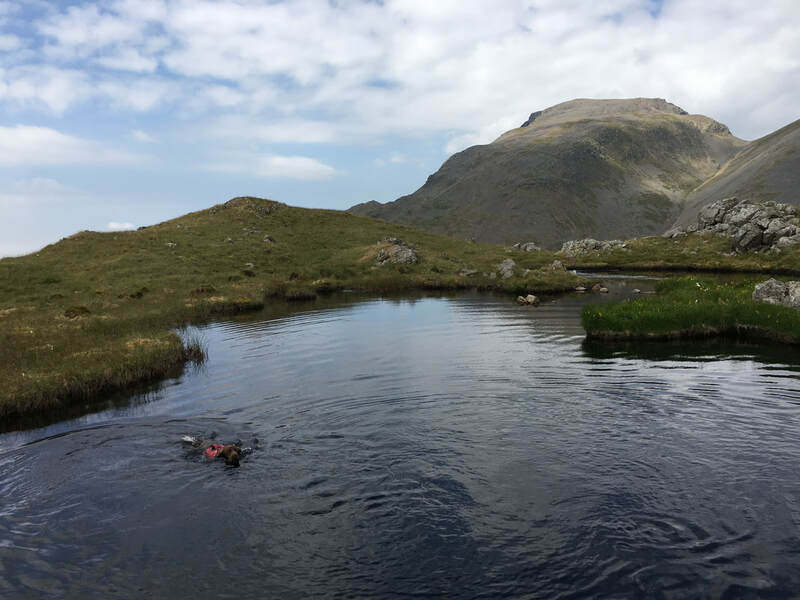 If you are not careful Lincomb Tarn is easily missed - would have been a shame not to have had a swim in it. 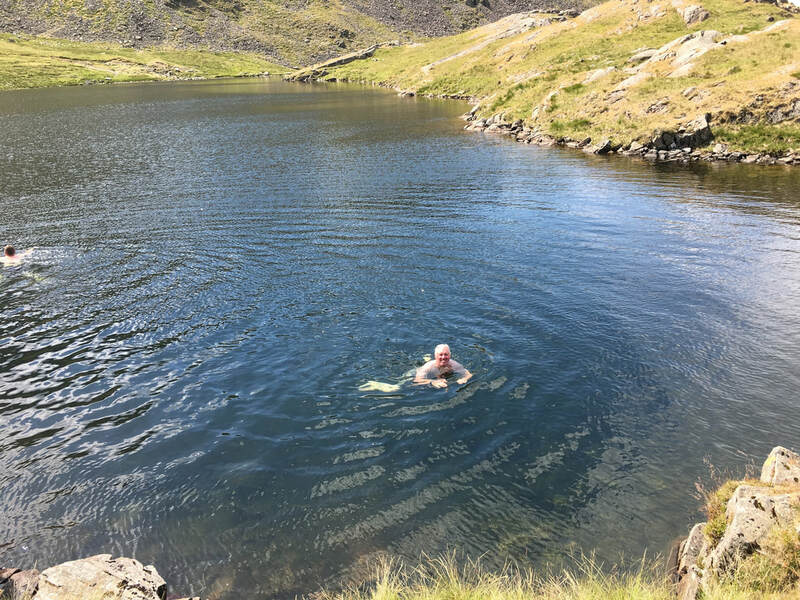 Here Alan has his second dip of the day - again with his hat on!